To kick of this year’s holiday workshops, I’ll be teaching a class to help you spruce up that front door with a double-sided custom wreath sign! And yes, that’s double-sided as in FLIP THIS BAD BOY OVER AND SHOW OFF YOUR WORK WELL PAST THE HOLIDAY SEASON! So grab your bestie and snag your ticket! A New Skill! In all of me lettering workshops, I start off by teaching you how to spruce up your own lettering. You’ll leave my class with a new found confidence in your ability to add a little beauty to anything around you with the art of modern faux-calligraphy. This is a perfect skill to add to your tool belt during the holiday season. Think of all the Christmas cards, gift tags, or maybe even a sign or two of your own, that you’ll now be able to beautifully design and create! A Beautiful Sign! Once you get the hang of your lettering, I’ll help you design and create a 6” x 24” double sided sign to hang over your front door’s wreath! I’ve created a process that is super forgiving, allowing you to confidently layout and letter both sides of your sign, so that you can leave with a something you are proud to show off! The Supplies! Not only will you leave with your new skill and door decor, you’ll also have some goodies to take home and use for future crafting. I’ll supply you with an easy to follow KRorerDecor lettering packet, filled with faux calligraphy how-to’s, my personal tips, and a list of my favorite materials to use. You’ll also have your sign, new paint pen, sketching pencils, and a customized mimosa glass as my thanks to you! Click here if you’re in! Like I said earlier, I will never let you leave one of my workshops without a new skill and beautiful product. The best part about these classes though? The QUALITY TIME with your mom, your bestie, roommate, sister, grandma, girl gang…it is such a FUN memory! It all adds up to the perfect day out! Click click click if this is calling your name!! I’VE GOT YOU! After my workshop, head out to grab a quick lunch, and then come right back! 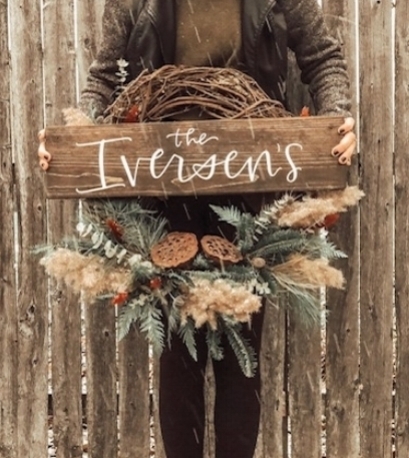 My friend Jordan, of Eden Floral Design, is the genius behind the beautiful wreath displayed in all these pictures…and she will be leading her own WREATH MAKING WORKSHOP at Imago Studio later that afternoon! Can’t make the workshop, but still want a wreath? She’ll make one for you ahead of time that you can pick up at my workshop! Click here to pre-order yours, and have it ready to bring home with you on the 8th!